Veteran educator Zhong Weihe said China should pay more attention to raising translators' social status and salaries, in order to attract more talent to the industry. 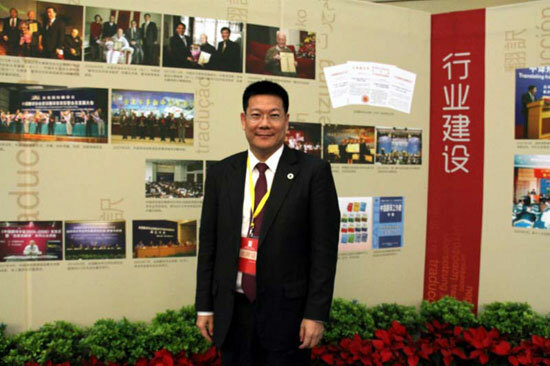 The 46-year-old president of Guangdong University of Foreign Studies received the Outstanding Contribution to Translation Industry Award at this year's National Conference on Translation held Dec. 6 in Beijing, a day which also marked the 30th anniversary of the Translators Association of China (TAC). In many Chinese colleges, however, managers prefer research papers to the translation works of foreign books as big references and supporters when deciding whether or not to confer an academic title or teaching post to any given teacher. "It is just so wrong," Zhong Weihe said, "The birth of good translation is not an easy process. It is a re-creation, innovative, and original. We should grant the translation a sort of original creation status. Nowadays, we do judge papers and translations by the same standards in Guangdong University of Foreign Studies; this is a big step." The teaching is one thing, the market is another. According to the rules set by the National Copyright Administration back in 1999 and still in effect today, the translation fee is 20 yuan (US$3.2) - 80 yuan (US$12.8) per 1,000 words. Many translators can hardly rely on this to make a living. "The rewards for translators are minimal, and this is a fact," Zhong pointed out, "There is a huge income gap between the professions of text translation and original writing; and there is also big income disparity between translators and interpreters. So you see many young people who have the ability and talent to translate, but they are not willing to do so." Zhong Weihe thought low incomes are the cause for bad results, "It is not only for historical reasons, but also due the lack of attention paid to the translation works." When predominant translation legend Yang Xianyi died on Nov. 23, 2009, there was a worried buzz that there would be no master translators left in the future China. Lin Shaohua, a veteran translator who translated popular novel "Norwegian Wood" by Haruki Murakami, said at the time that China's translation industry's biggest problem is the "talent shortage crisis." "The old translators have either died or can no longer work because of their old age; the younger ones still have much to learn; and the middle-age ones like as me, all fail hugely in our attempts to make a living and achieve our goals." At this time, the new media enter the bigger picture. The Internet has created many opportunities. Some websites offer translation services and even social networking platform discuss certain translation works. A classic example is that of Steve Jobs's authorized biography by Walter Isaacson in 2011. In trying to publish the Chinese edition as soon as possible, the publisher and the translators recruited from Yeeyan.org gathered online and 'group-translated' the book. However, the quality of the translation was highly debated. "When working on such a best-seller, the publishing house must catch up with the times," Zhong explained, "So the translation will not be as good. I still feel the translation can be amended when they re-print it. But the Internet will surely boost translation and interpretation practices and people can now exchange ideas on the platforms since translation never has one standard or correct answer. " As a translation professional and educator, Zhong urged society to establish good soil for the seeds to grow. "We cannot just produce a master translator in university. It will take a long time for a master to work his way up to the top. School must provide a cradle to help them grow healthily. And society, as well as some industries, should provide a good environment for them. We should recognize translators' social status, recognize the translation's importance and raise translators' benefits. Only if our nation pays attention to its translators and their works, either from the political side or the legislative one, will we witness the birth of many a master translator."